Kris was born and raised on the Texas Gulf Coast. She graduated from Texas A&M University in 2005 with a BS in Animal Science and minor in Genetics. In 2009, she graduated from Texas A&M's College of Veterinary Medicine, and returned to Galveston County. In school, she heavily pursued Equine Medicine, with an emphasis on Dentistry. Post-graduation, in order to keep up to date on new treatments, she far exceeds the state required minimum of Continuing Education hours each year. Since opening her practice, she has developed an interest in wounds and soft tissue surgery, particularly sarcoid tumors. She began EMVS as a solo practitioner in 2009, and slowly expanded while working full time as a small animal clinician. In 2012, she reduced her small animal workload in order to put more into her growing business, and is now practicing full time with EMVS. Dedicated to educating clients about equine health care. Kris and EMVS are dedicated to client education and preventative medicine, to keep your horse happy, healthy, and safe into his golden years. At this time, the practice is exclusively mobile, but a clinic in Santa Fe will one day be a reality. 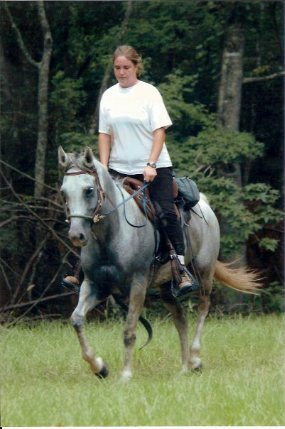 In her spare time, Kris enjoys the sport of Endurance, both as a rider and as a veterinarian, giving her a unique perspective on the athletic horse.